Mark Bellows and Ryan Brodziak, who founded The Local Omnivore, originally met when they were working at a pizza shop. Now, the duo has gone back to their pizzeria roots with their newest culinary venture — but they’ve done it their own way. You can spot Pink Gorilla from a mile away thanks to the glowing neon sign in the windows, and it’s got major old-school pizzeria vibes. From the speckled linoleum flooring to the textured plastic cups, you’ll be transported back to your childhood. The pizzas, however, are a step above what you would have enjoyed in your younger days. Sure, they have the standards like the triple pepperoni and even a twist on a Hawaiian pizza. However, the experimental pies are where they truly shine. 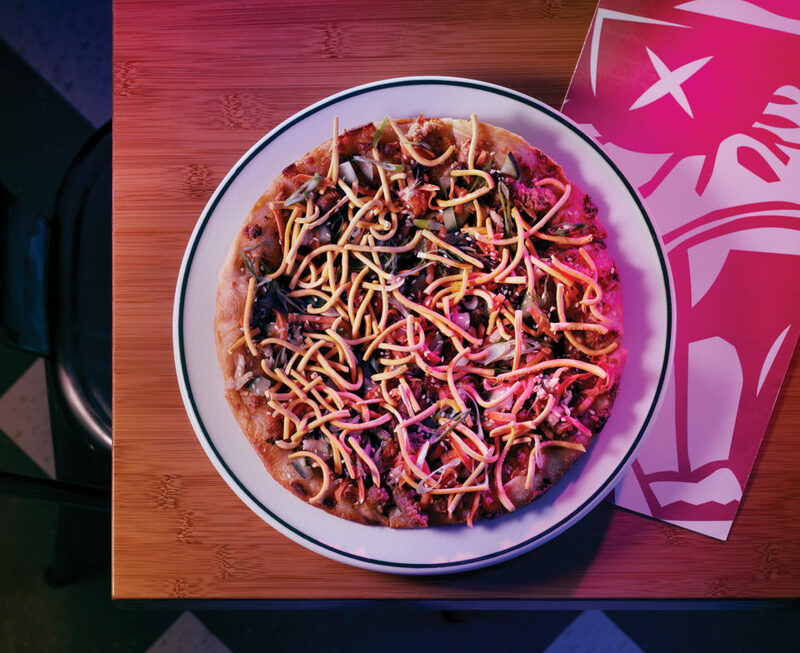 A standout was the gingered beef pizza, which is loaded with crumbles of gingered beef, mozzarella, pickled carrots, green onions, cucumber, a ginger sauce that packs a fair amount of heat, drizzled with sesame oil and sprinkled with sesame seeds. It’s a culinary mash-up in the most delightful manner. While the toppings are generous, the crust remains wonderfully crisp. Also worth noting is the Two Generals, a must try for any cheese lover. The pie is topped with garlic oil and zaatar, then sprinkled with cheddar, mozzarella, feta, parmesan, fior de latte, halloumi, cheese sauce and labneh for good measure. That’s right — a six cheese pizza. And don’t forget to try at least a few sauce options. Each pie comes with your selection of a sauce, or you can go for the dip flight where you can sample four — and you probably should. The sauces are worth trying and add other dimensions of flavour to your pizza. They’ve got the classics, like marinara and cheese sauce, as well as unconventional picks, from labneh and honey (so fresh, yet creamy at the same time) to tahini maple sauce.